SuperMount 82 Victory by First Team, Inc.
NBA REGULATION WALL MOUNT SYSTEM WITH 1/2" THICK GLASS BACKBOARD. Institutional Grade! Includes FREE Backboard Padding in Choice of 16 Colors. 8' to 12' Wall to Backboard Extension. 42" X 72" NBA Regulation Tempered Glass Backboard. This system has a regulation NBA backboard and rim and is perfect for any gym's main court, side court or your home gym. The 1/2" thick glass backboard is the same as used in NBA arenas. Package Includes FREE TuffGuard molded bolt on backboard padding in your choice of 16 colors. Model FT72C ($170.00 value. select above). You can add a height adjuster if you want to be able to lower the rim to 8'. Model FT310 (select above). Shop around and compare these features. BACKBOARD: 72" X 42", NBA regulation 1/2" Thick Glass Backboard. The backboard has a lifetime warranty against breakage during dunking because the rim is bolted directly to the support system and not to the backboard. You don't have to worry if someone hangs on the rim. Includes FREE TuffGuard molded bolt on backboard padding in your choice of 16 colors: Black, Gray, Royal Blue, Scarlet,Navy Blue, Columbia Blue, Kelly Green, Desert Gold, Forest Green, Orange, Purple, Maroon, Saddle Brown, Sienna Orange, Brick Red and Gold. (select above). Choose from 16 School Colors! 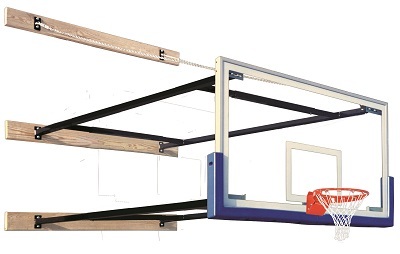 MOUNTING STRUCTURE: Unique TELESCOPING design allows the backboard to be mounted anywhere from 96" to 144" from the wall. No tube cutting required. Square tubing is used to eliminate the sway caused by systems that use round tubing plus it looks much nicer. Other sizes of 48" to 72", and 72" to 96" are also available (see Wall Mount page for other sizes). The structure can be mounted to most wall types using 3 load spreading hardwood wall struts. The wall struts are included. Please call us if you have any mounting questions! BREAKAWAY RIM: Institutional Grade NBA style breakaway goal with First Team's continuous-wire net attachment system, no plastic net clips on this rim. This is the same rim First Team has sold to thousands of schools and colleges world wide, it's the real thing. Package includes mounting structure, wall boards, support chains, backboard, breakaway rim, backboard padding, instructions and all mounting hardware except that required to anchor wall boards to wall. UPGRADE TO THE TRIUMPH PACKAGE: This package includes an upgraded backboard and rim. The backboard is upgraded to the FT235. Guaranteed to be unbreakable with extra steel support in the rim mounting area and built-in goal leveling feature. The rim is upgraded to the FT192, a stronger breakaway rim with a long lasting positive lock mechanism. Upgrade package total: $190.00 (select above). BACKBOARD: FT234 - 42" X 72" X 1/2" Thick Tempered Glass. RIM: FT190 - Competition Heavy Duty Breakaway Rim. MOUNTING STRUCTURE: FT2020 - Heavy Square Steel Tubing Powdered Coated Black. EXTENSION: 8' to 12' Wall to Backboard. Telescoping. DELIVERY TIME: 5 to 8 Days From Order Date. SYSTEM WEIGHT: 595 lbs. (shipping weight: 605 lbs.). Purchase Orders Welcomed! Fax purchase orders to 425-675-2994. If you need a printed invoice call us toll free at 888-836-2992 or you can print an invoice online by following these steps. 1) Add the items you want to the shopping cart. 2) Go though the checkout process and select "Purchase Order" in the payment type. 3) Print out your invoice. Need more than two? Discounts available on multi-unit purchases. See Ready To Order box above for details. Shown with optional Backboard Height Adjuster (select above). FREE CURB SIDE TRUCK FRIGHT SHIPPING on this unit. Free Lift Gate Service is provided where required. 2 - 3 Save $75.00 ea. 4 - 6 Save $100.00 ea.